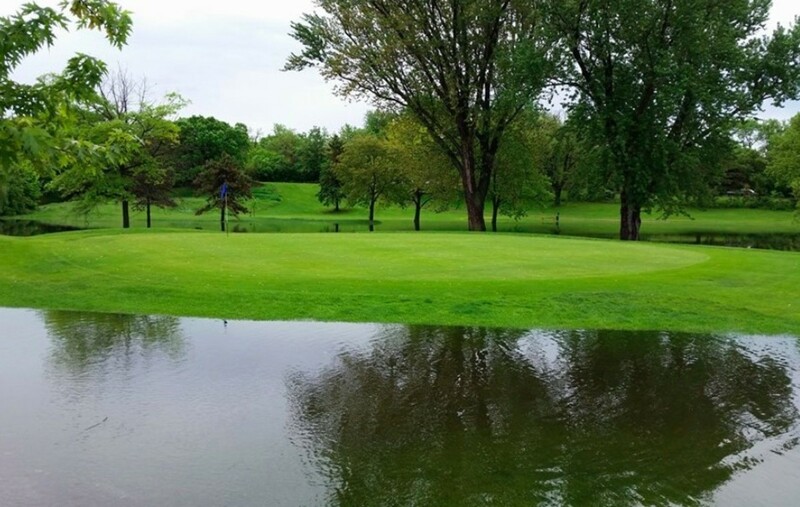 Hiawatha Golf Course is the subject of two public meetings on Monday and Tuesday evening, as the Minneapolis Park and Recreation Board tries to figure out what to do with the flood-prone land. 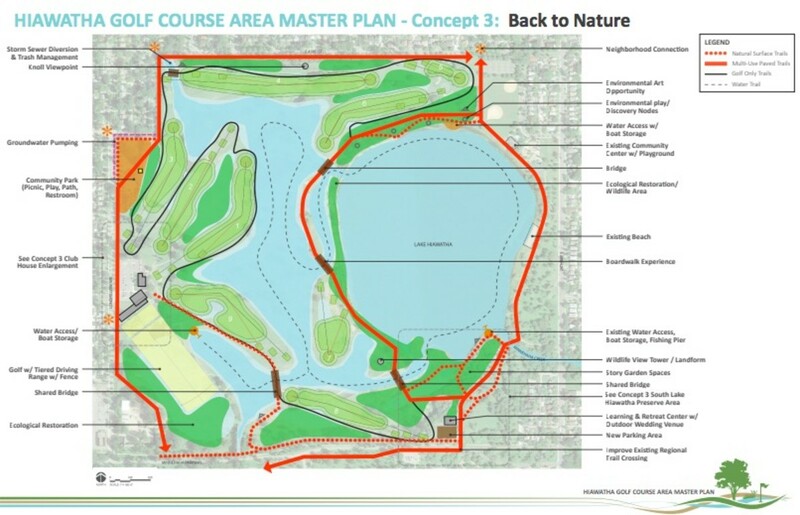 The future of the course off of Cedar Avenue in south Minneapolis has been under a cloud since 2014, when heavy flooding led to the discovery that it was pumping 262 million gallons of groundwater every year into nearby Lake Hiawatha to keep the course playable – several times the amount agreed with the DNR. The Parks Board voted to close the 18-hole course, which had been reduced to 9 holes after the flooding, in 2017, but this was delayed as alternative uses for the land were sought. It now plans to reduce pumping of the groundwater to 94 million gallons a year, which would lead to some parts of the current course being flooded year-round. The question now is what will happen with the land once the pumping is reduced, and the Parks Board is seeking feedback on three concepts that were recently made public. 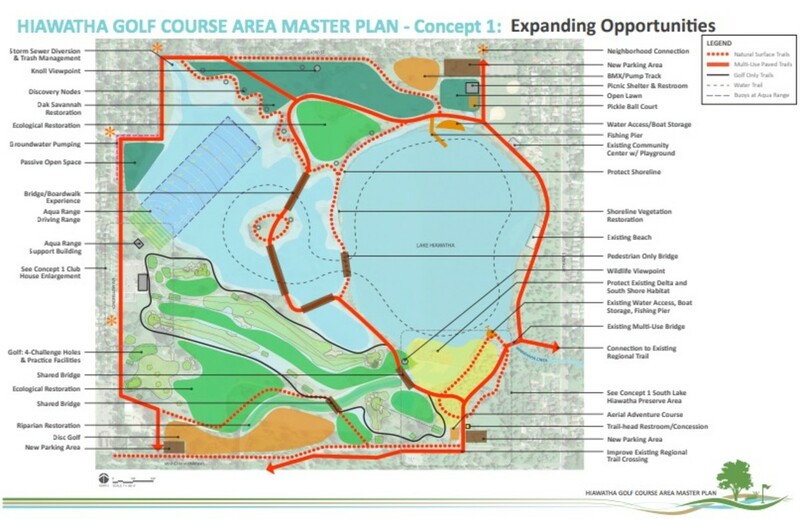 Each of them retains some element of golf, albeit on a smaller scale, with other potential additions to the course including a BMX track, an aquatic driving range, an aerial challenge course, and an amphitheater. This would see the creation of 4 “challenge” golf holes as well as an aquatic driving range (drive into the water, basically). Elsewhere, there’d be a pickle ball court, BMX track, an aerial adventure course, and a bridge/boardwalk over the newly created water channel. 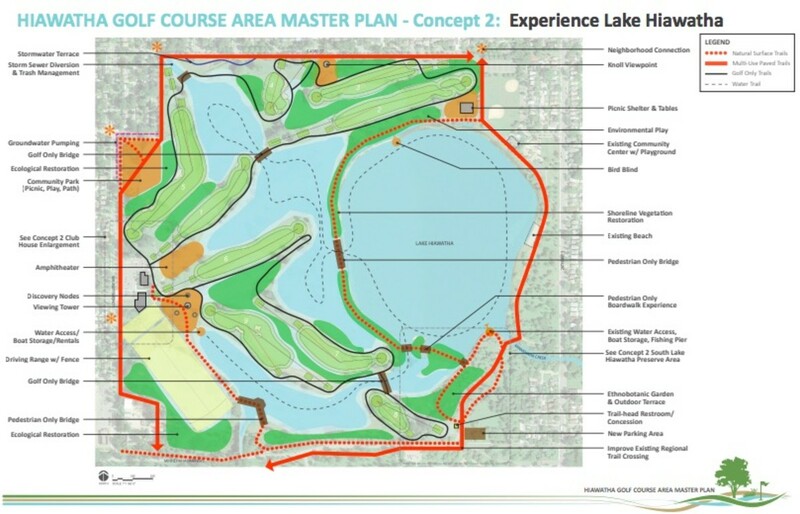 This would retain a 9-hole golf course, albeit with a different layout, at the site, along with a fenced-in driving range, an amphitheater, and a picnic shelter with tables at the north end of Lake Hiawatha. This would also see a 9-hole golf course kept at the site along with the driving range, but without the amphitheater and picnic facilities. Instead, more of the excess land would be used for ecological restoration, wildlife attractions and environmental play, as well as a learning and retreat center with an outdoor wedding venue. The Star Tribune reports that the cost estimates for the three concepts range from $28.2 million and $62 million. Feedback sessions will be held Monday between 6 p.m. and 8:15 p.m. at the Hiawatha Golf Clubhouse at 4553 Longfellow Avenue, as well as between 6 p.m. to 7:30 p.m. on Tuesday.